Today is Planting Day! 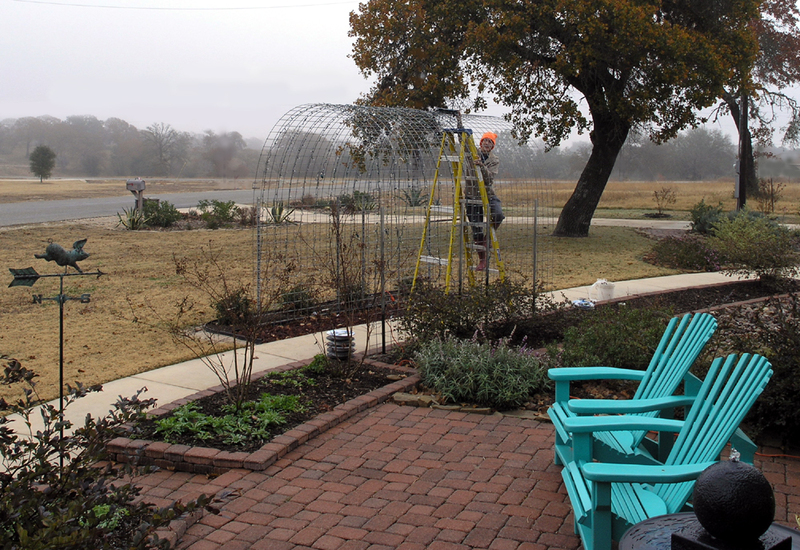 The first task is to put in the grape vines on the trellis. The twisting tendrils of the vines and the hanging clusters of grapes are fun to do. Next is the Lavender with that wonderful scent. The flowers are painted first, then I come back in and paint the greenery. I work around the purple of the blossoms so their color remains crisp and clean. Petunias have been potted in the ceramic container Nicky is sitting next to. Ultramarine Blue + White was used for the blue ceramic. 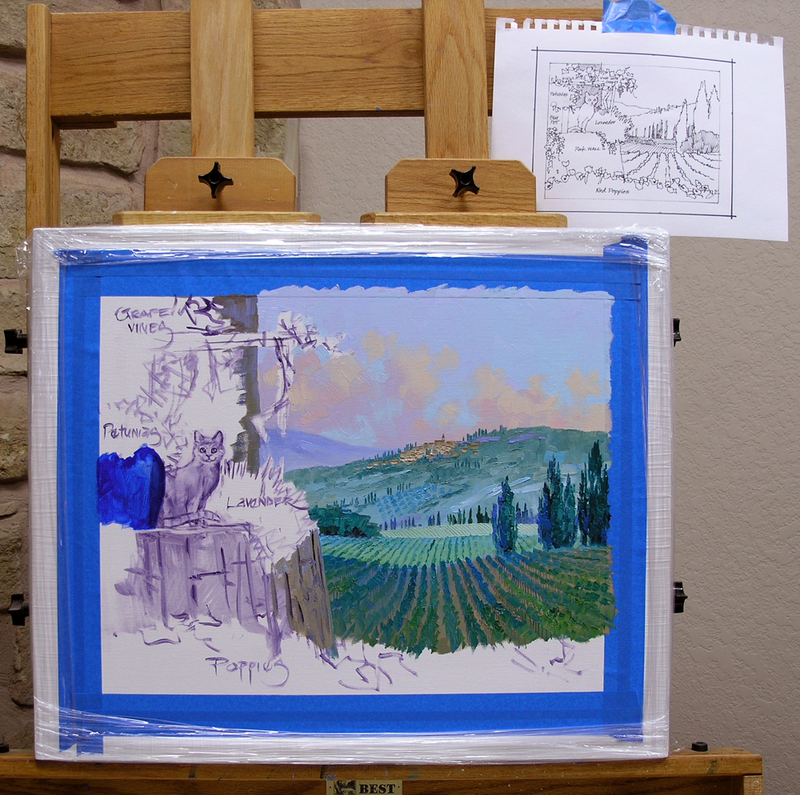 I originally had a square pot in the sketch taped to my easel above the painting. You can see it better by enlarging the image, just click on the picture. 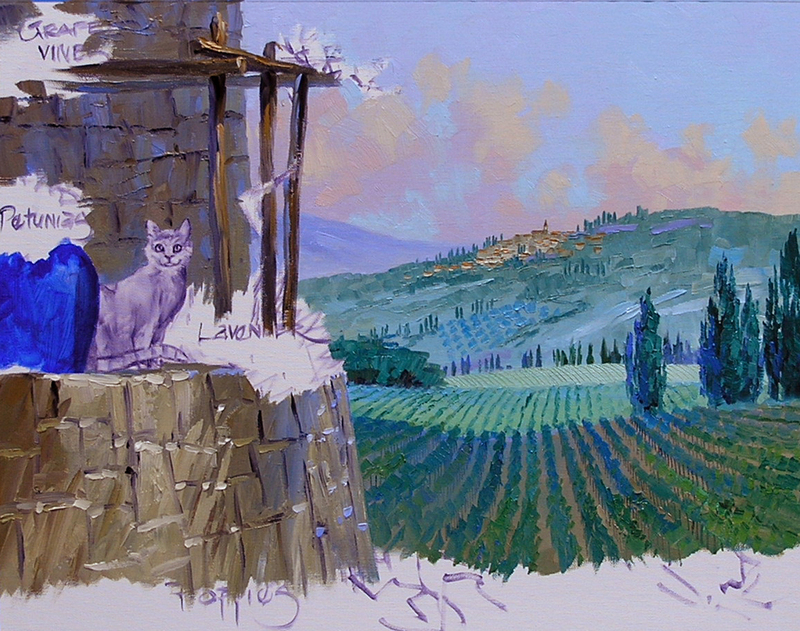 After getting the piece drawn up on the canvas I realized there were just too many straight, up and down lines with the distant cypress trees, wall, building and trellis. Rounding the pot gives the painting a better feel. The colors for Nicky are mixed and ready to go. 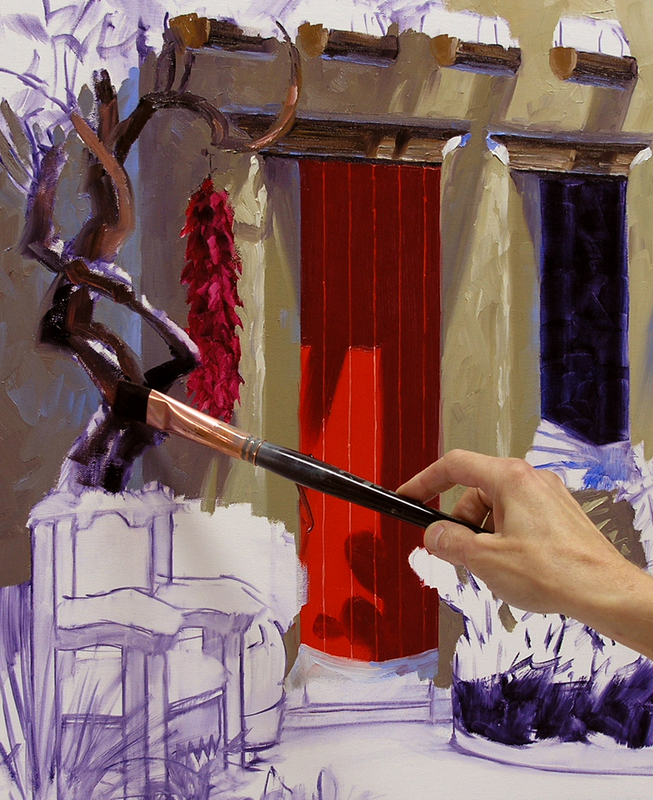 The sienna colors are a mixture of MUD (Ultramarine Blue + Alizarin Crimson) + Cadmium Orange + White. The green for his eyes is some of the distant vineyard color lighted a bit with White. 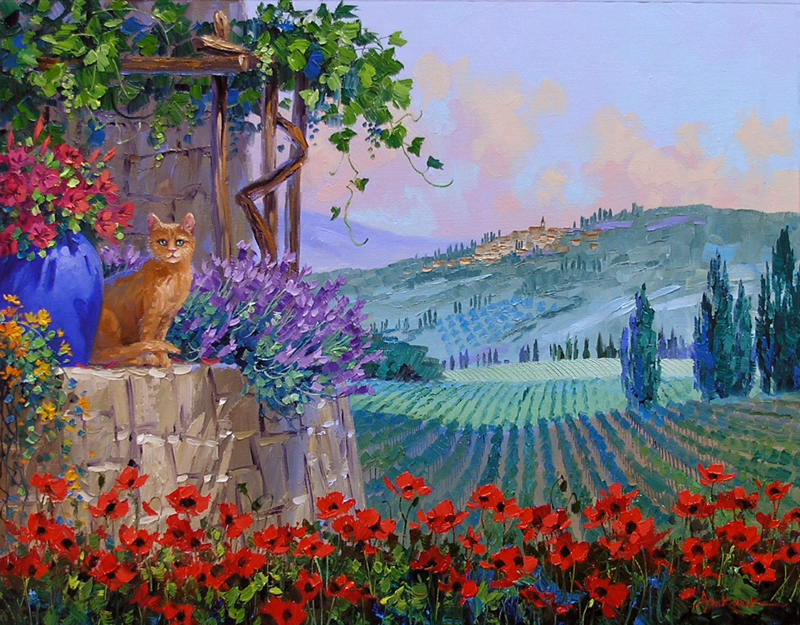 Nicky is now perched in his sunny spot above the poppies. Notice the blue along the side of his head and back, reflected from the blue container. In the early process of putting Bonnie’s ideas together in a sketch I had thought of having Nicky looking off into the distance. 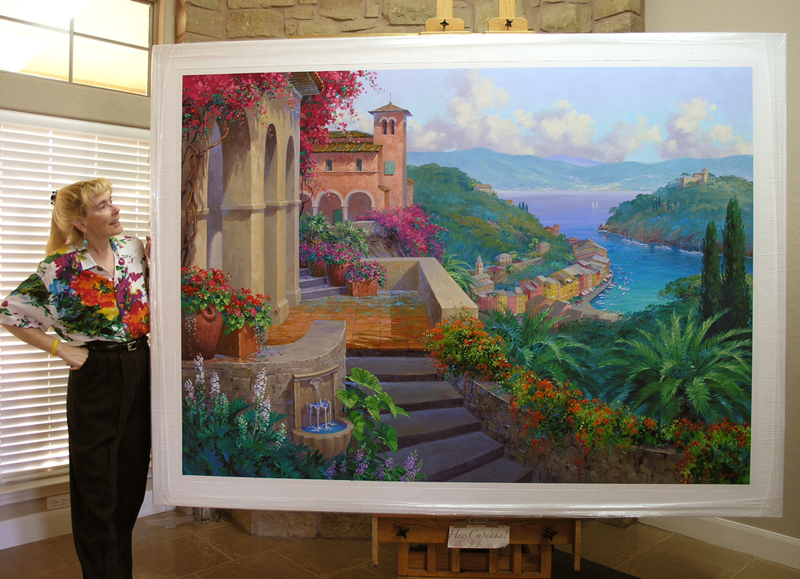 Then Bonnie mentioned the painting was to hang in her kitchen. At that moment I knew I had to turn his head so he could keep an eye on her as she puttered around. 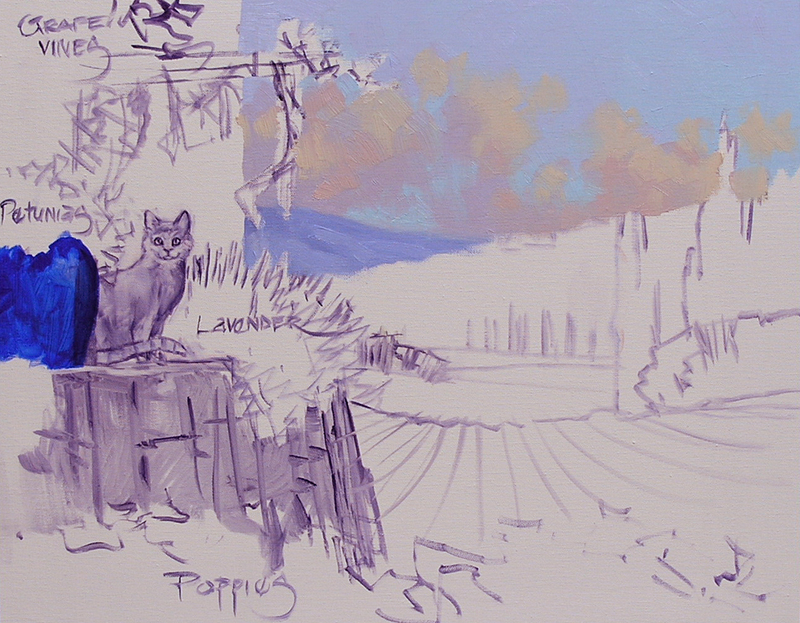 I’m using the corner of a large brush to block in the poppy blossoms, letting them dance in the Tuscan sunlight. The rolling hills of Tuscany are covered with vineyards. I want the distant fields to be sunlit, the farthest one the lightest. 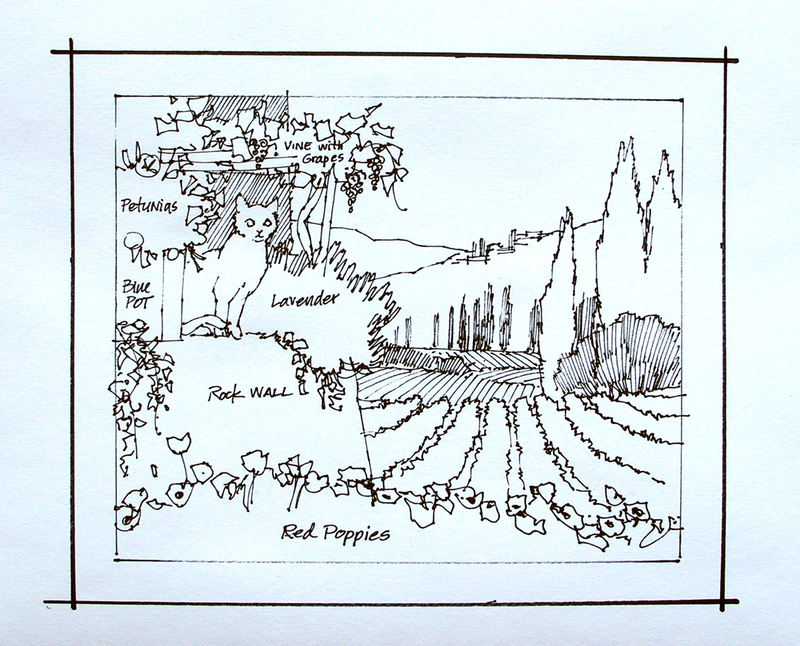 The closest vineyard, not yet painted, will be in shadow which will provide a dark backdrop for the bright red poppies across the foreground. I keep the greens cool but add a touch of Hansa Lemon Yellow to the colors used on the mountain to warm them just a bit. 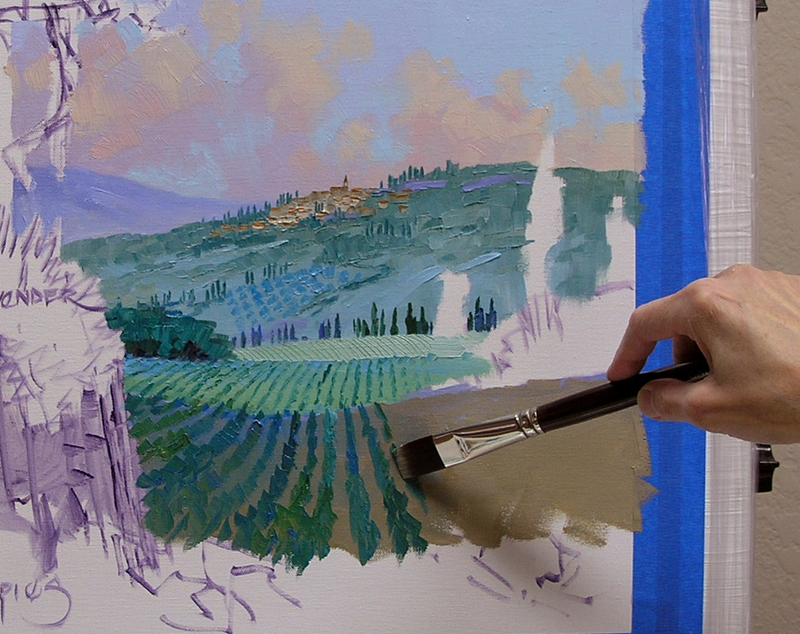 Using the darker adobe colors from the hilltop village I paint the ground for the closest vineyard. The vines are worked into the wet paint. 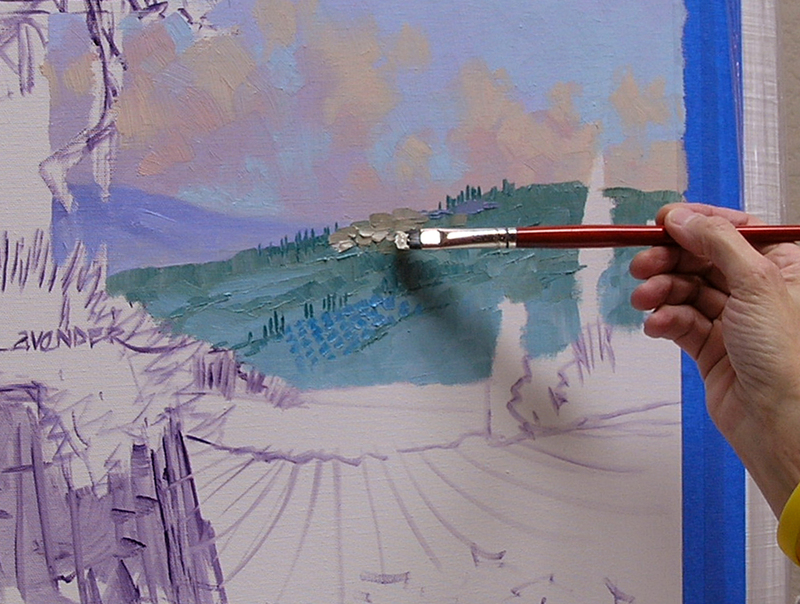 Above is an example of another technique that gives depth to a painting, Perspective. The perspective of the rows of vines direct the viewer’s gaze into the distance. The rows on each vineyard get smaller as they recede, making them appear farther away. We’re ready to begin on the rock building and wall. 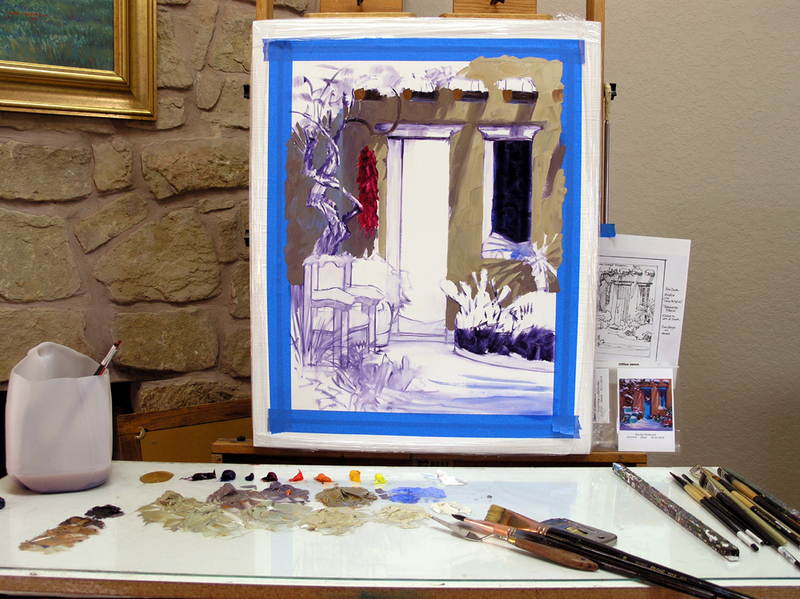 Using mixtures of varying proportions of Ultramarine Blue + Cadmium Orange + White for the structures. Some dabs bluer, some warmer with more Cadmium Orange. 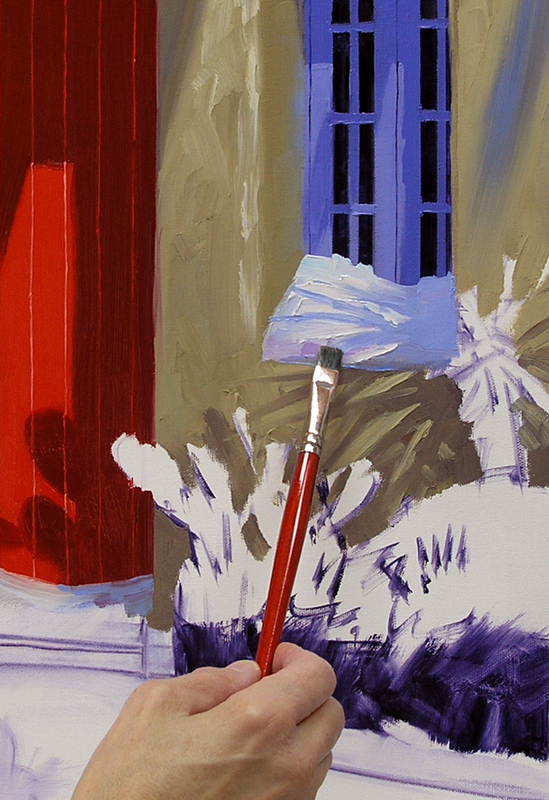 A little MUD (Ultramarine Blue + Alizarin Crimson) is used in the darkest mixtures. The bluer mixes are used for the building behind the trellis. The warmer mixtures are used on the front wall, washed by the sun. Please notice, the far edge of the wall is bluer while the closer portion of the wall, under the kitty, is warmer and lighter. The next step forward is the mountain with the typical Tuscany hilltop village. I’ve mixed several different shades of cool green using varying amounts of Pthalo Blue + Cadmium Orange + White. More Pthalo Blue in the mix makes the color cooler, see the three dabs on the far right. More Cadmium Orange makes it warmer as seen in the center three dabs of paint. The adobe colors are for the buildings in the village. These were also mixed with a touch of Pthalo Blue + Cadmium Orange + White. 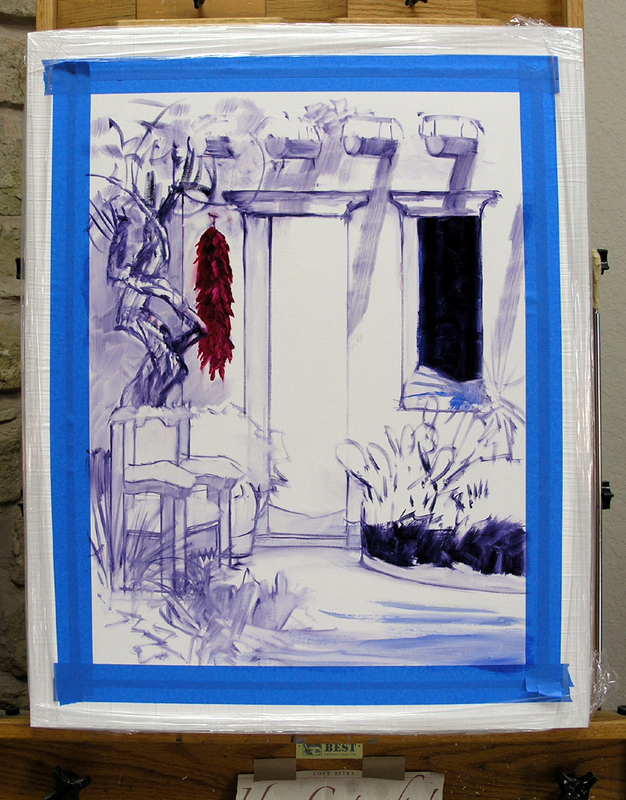 A little MUD (Ultramarine Blue + Alizarin Crimson) was added in the darkest mixture. It is amazing how mixing the same three colors in different proportions results in such a wide range of hue. The small dabs of color on the far left are from the sky, left over from yesterday. I’ve begun blocking in the mountain the village is located on. The distant, bluer mountain is already beginning to recede. Notice also the top edge of the far mountain is made softer. 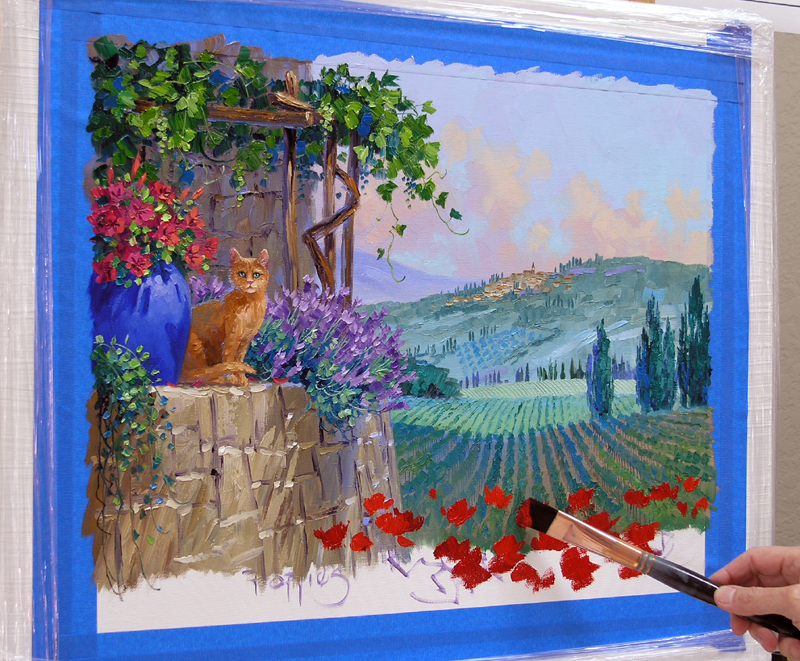 Here is another helpful rule in painting: Soft Edges Fall Back, Sharp Edges Jump Forward. This is a technique you can use to give distance to your painting. By softening the edge of the distant mountain it draws less attention. The harder edge of the mountain I’m painting comes forward. 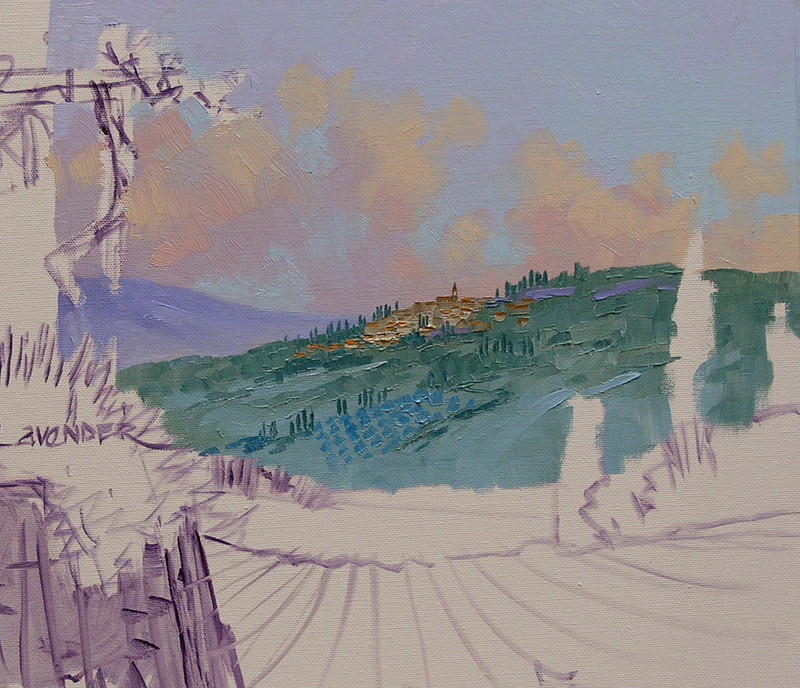 Using the corner of a “bright” brush I plant an olive grove on the hillside. The same brush is used to block in the village. The darker values are painted first, then I come back and add the highlights where the sunlight catches the ancient rock buildings. My client has been so understanding and patient. When she ordered this commission several months ago she said, “This is my Christmas present to me, so there’s no need to rush. You don’t have to have it for Christmas. Go ahead and do the paintings that have to be done for December 25.” Well, all of the surprise pieces are done and shipped. Now, on to Tuscany! I’ve been so looking forward to doing this painting. 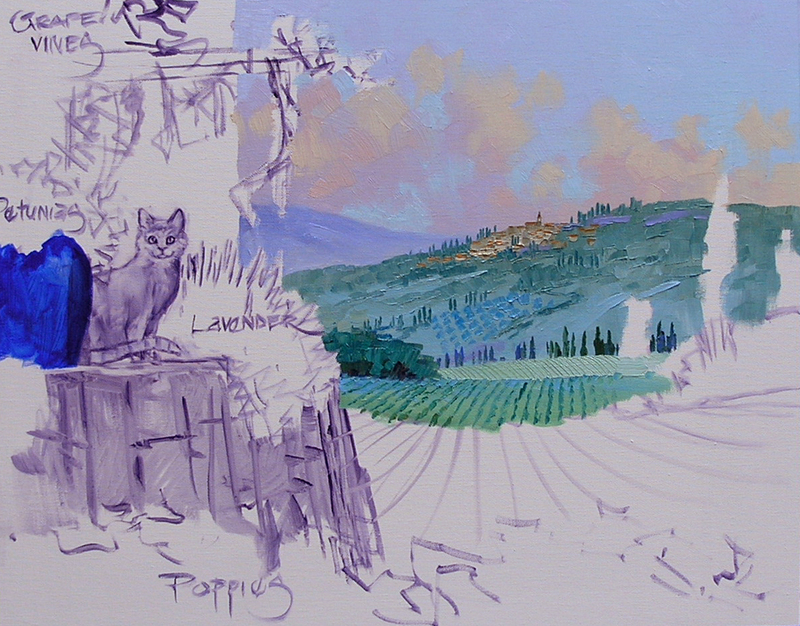 Bonnie has fond memories of the poppy fields, hillside villages and vineyards of Tuscany. She also wanted to somehow include her favorite cat, Nicky, who sadly is not with her anymore. 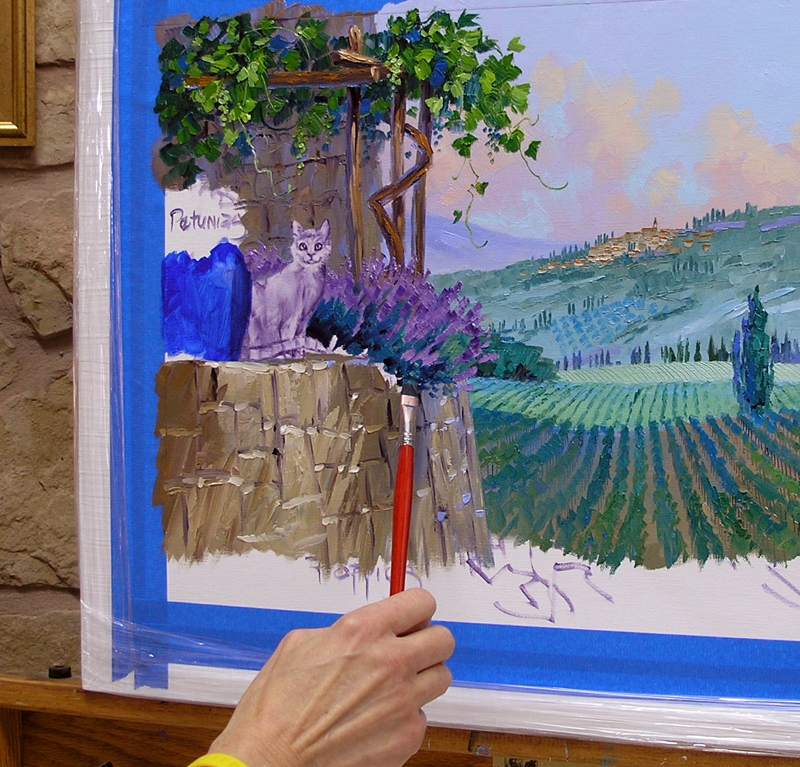 Bonnie wanted to capture many of the touches of the Tuscan landscape in her painting. She also wanted the corner of an ancient rock building or wall. This has been a lot of fun to work all of her requests into the piece. The sketch met with her approval, I’ve just been waiting to finish up my other commissions to get started. This morning I got to work drawing it up. 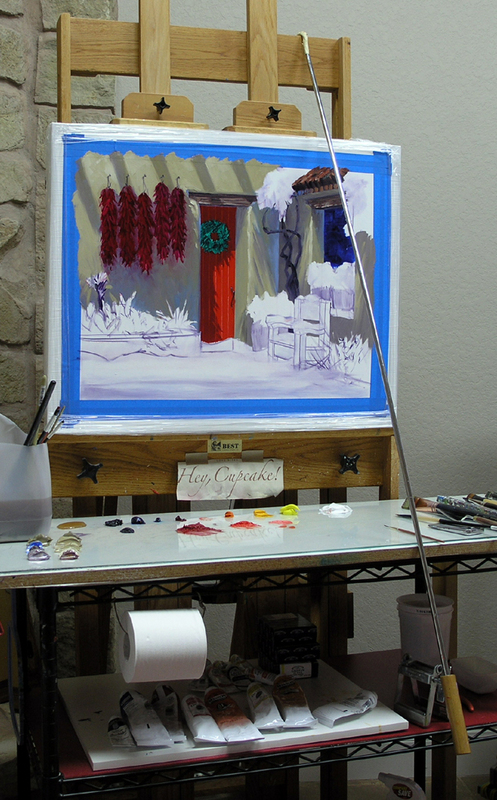 After all the elements were sketched on the canvas I heard a sound at the window by my easel. Guess who was peering in? I imagine Slinky came to investigate the “cat on the canvas”! The sky is the starting point for any landscape painting I do. This is where the light comes from, setting the tone for the entire piece. Also it’s the farthest back. In painting landscapes I work forward from the most distant point. My colors for the sky are mixed and laid out on my palette above. From left to right the mixtures are: MUD (Ultramarine Blue + Alizarin Crimson) + Cadmium Red Light + White, MUD + White, Cadmium Orange + the littlest touch of Ultramarine Blue + White, Pthalo Blue + White, and Ultramarine Blue + White. All of the mixes have a tiny bit of the color and a LOT of White. 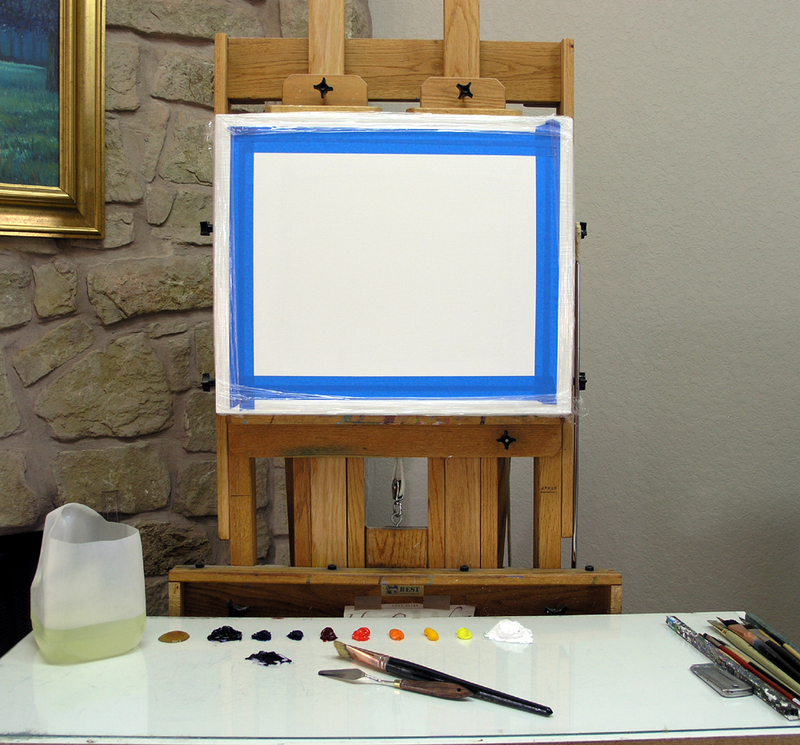 I was asked a very good question the other day, “What kind of easel do I use to paint on?” They say a picture is worth a thousand words so here are several! 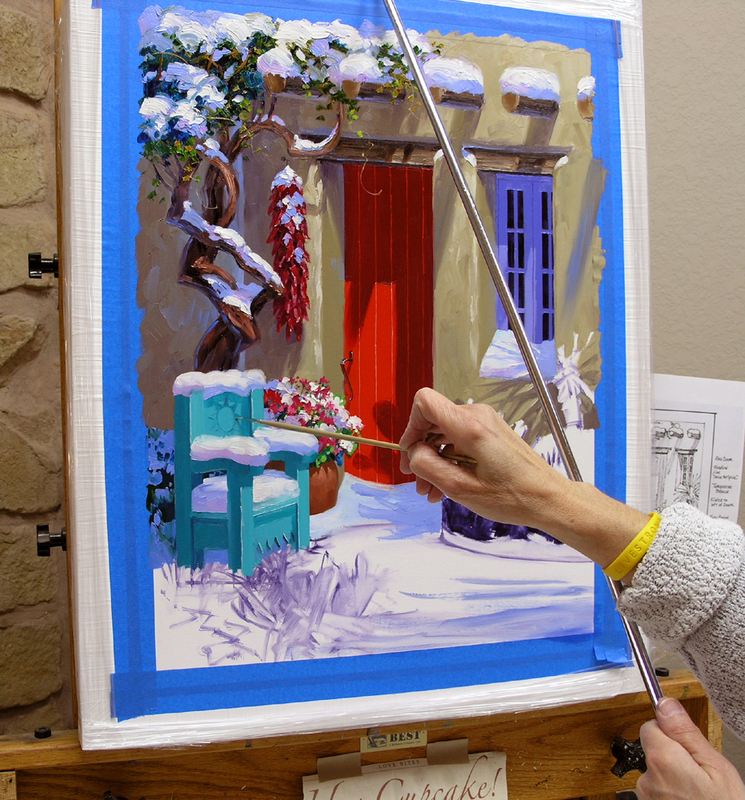 We use the BEST Classic Santa Fe II Easel. When Jack and I were traveling, living in places where people take vacations, we would make easels out of 2×4 lumber. They were very portable and didn’t take up much room tied on top of our Ford Explorer. With the exception of tax records, which we had in storage, everything we had fit in or on top of the SUV. So space was at a premium. When we began to settle down we decided to purchase “Real” easels. After a lot of research this is the one we picked. The best is made by “Best”! 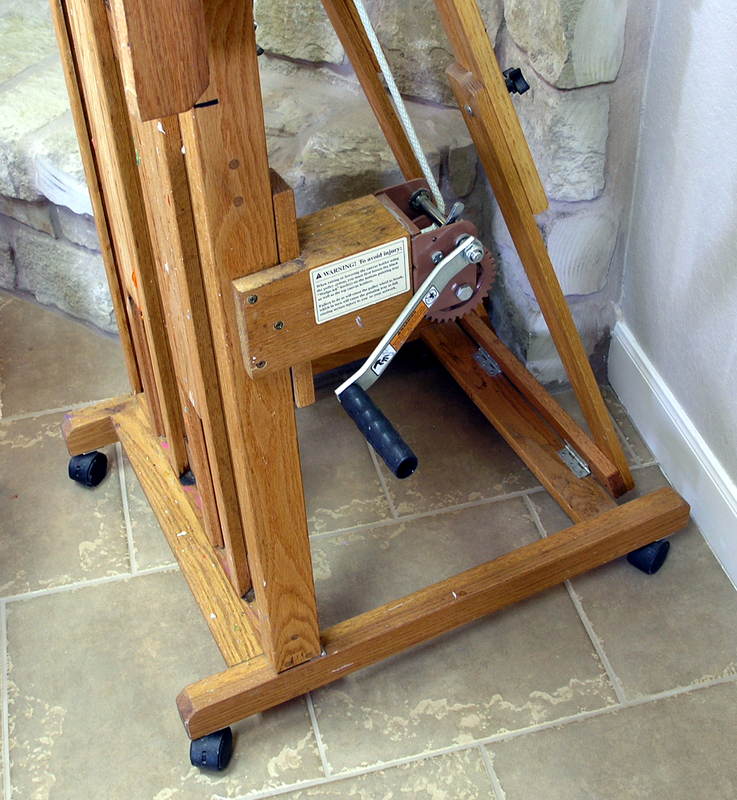 It has a crank that allows the artist to raise and lower a painting without having to take it off the easel. 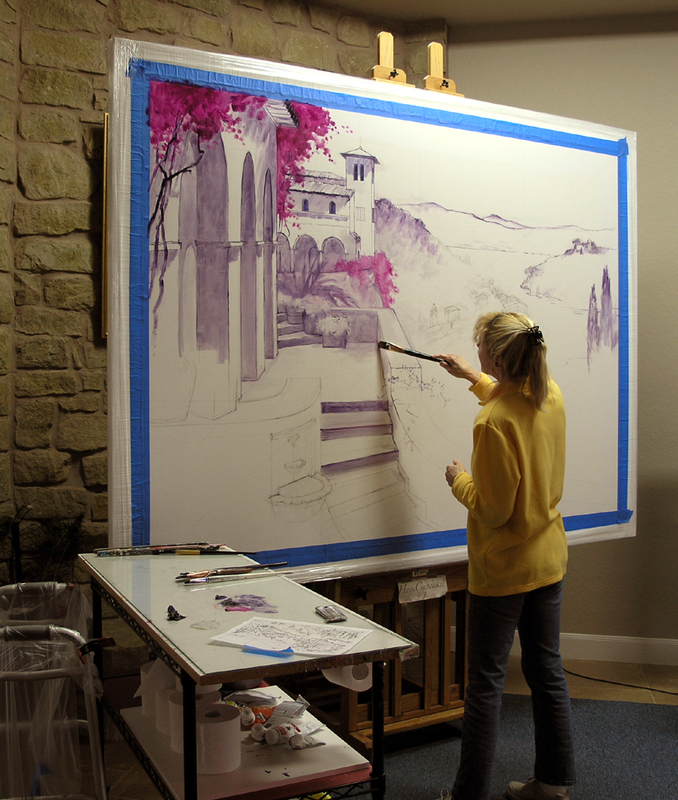 In the picture above I’m working on a 6′ x 8′ painting. My canvas can be cranked up even higher to work on the lower portions. This prevents having to reach up to paint, which puts a lot of excess strain on your shoulder and rotator cuff. My palette is on a base with wheels. I just rolled it to the side so I could stand up close to the painting. 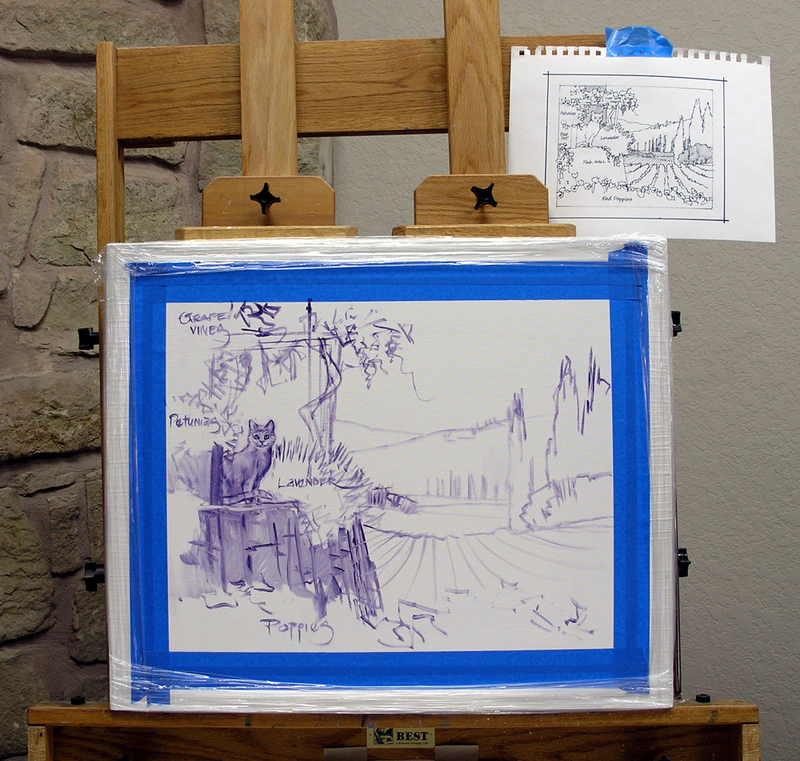 The easel comes with an extra canvas holder that can be attached to place smaller canvases on. You just slide it over the uprights and tighten the black knob on the right side. 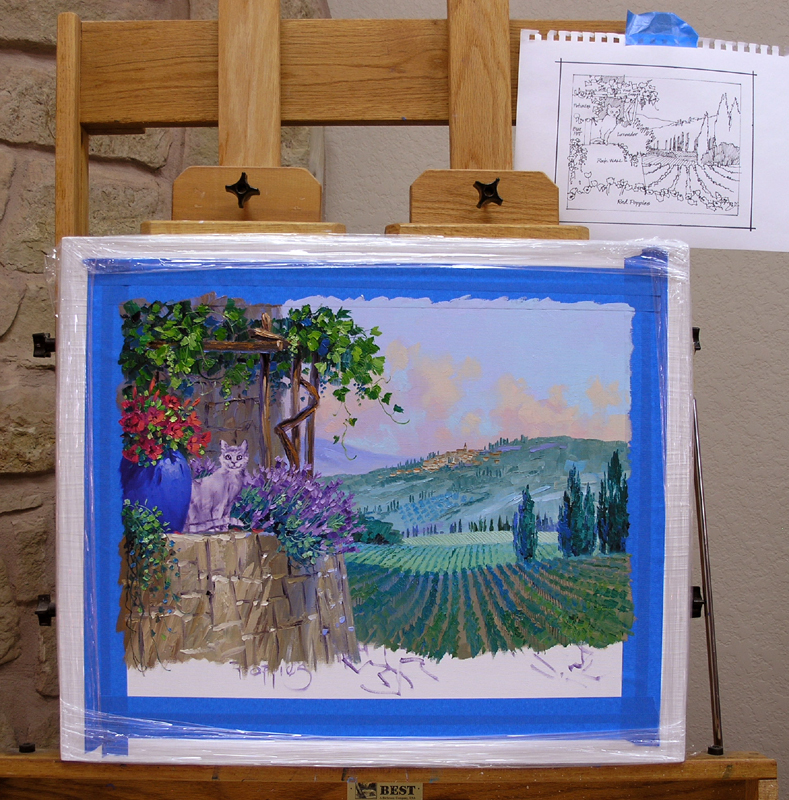 The easel can be purchased at most online art supply companies. DickBlick.com has the most reasonable prices we could find. But shop around, this easel is well worth the investment. We’ve had ours since 2001 and love them. My palette is back in its usual place in front of the easel. This is the most efficient way to work. You don’t have to twist and turn to get your paint like you would if it were on the side. 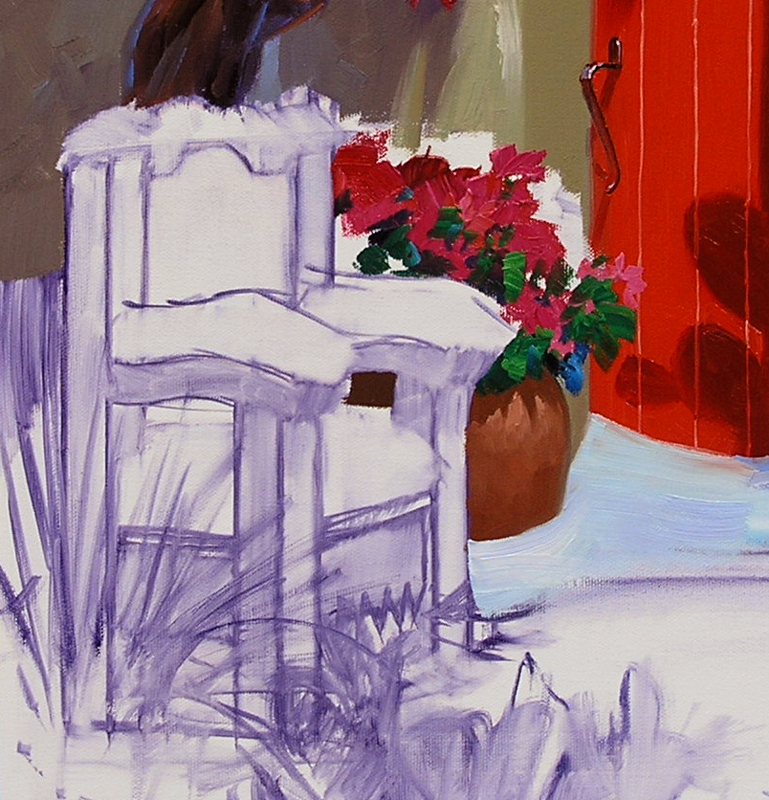 “Cool colors recede; Warm colors come forward”, one of the most basic rules in painting, also applies to snow. Artists paint on a 2 dimensional surface, the canvas, attempting to make it appear 3 dimensional. So I paint the shadows of the snow near the door more blue (cooler). 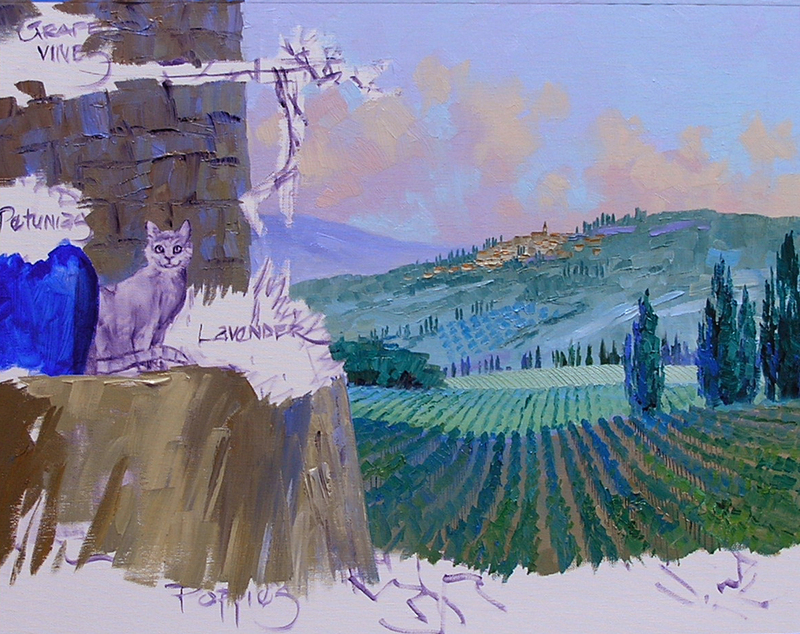 As the shadows come to the front, closer to the viewer, I make them more lavender (warmer). This helps give depth to the piece. The red fruit of the prickly pear also adds a touch of color. 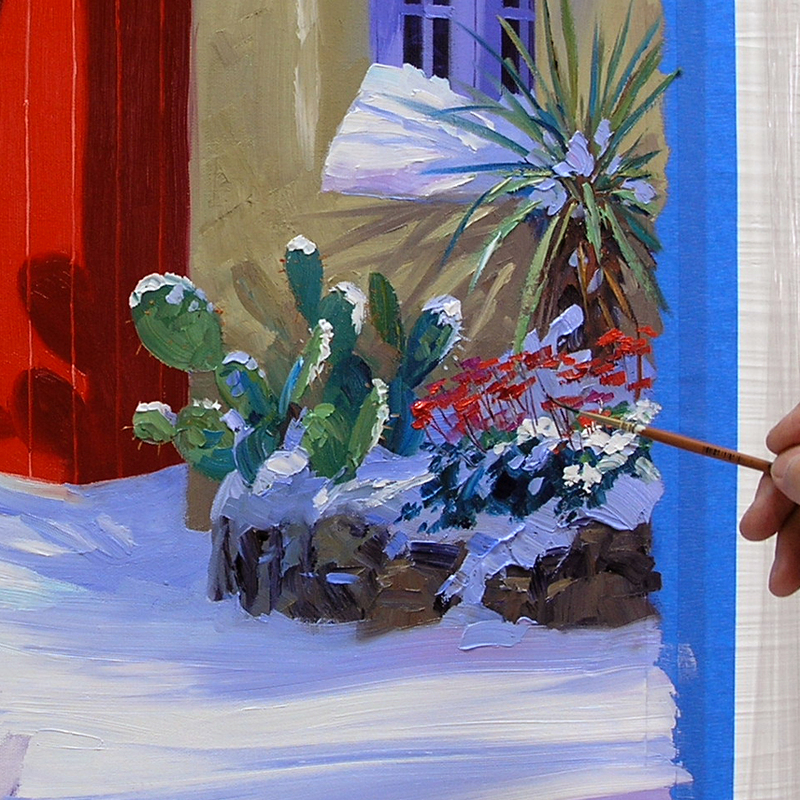 The bright white snow running behind the dark uprights of the cactus and yucca is another method to add depth to a painting. The shadow across the front of the painting adds to the dimension as well, acting as a “Threshold”. 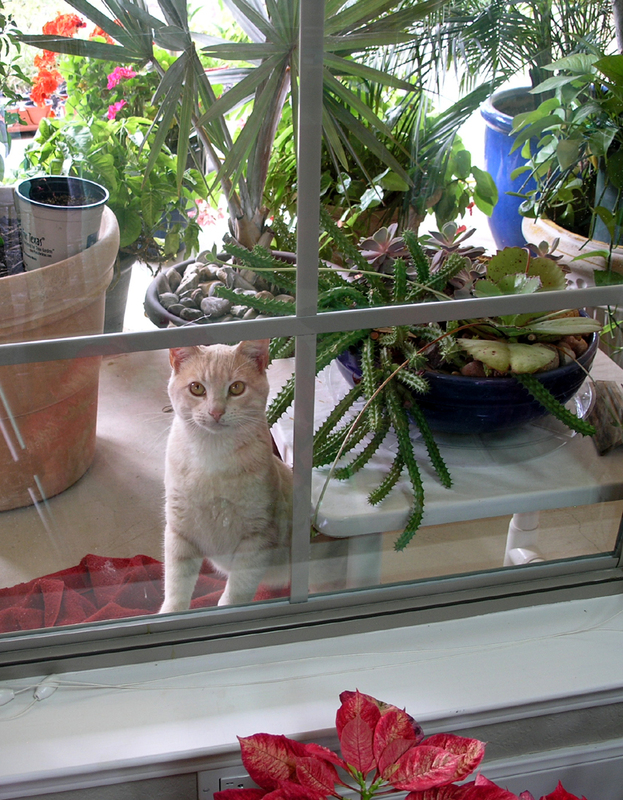 Think of an open doorway to a well lit home at night. Your eye naturally goes to the light in the open door, crossing the “Threshold” of darkness. The same happens here, the viewer’s gaze jumps over the darks in the foreground to the brightness beyond. Since I’ll be painting a lot of snow today I go ahead and mix the colors needed. On the right side of my palette are various shades of blue and lavender for the snow. On the left are the mixes for the wisteria. 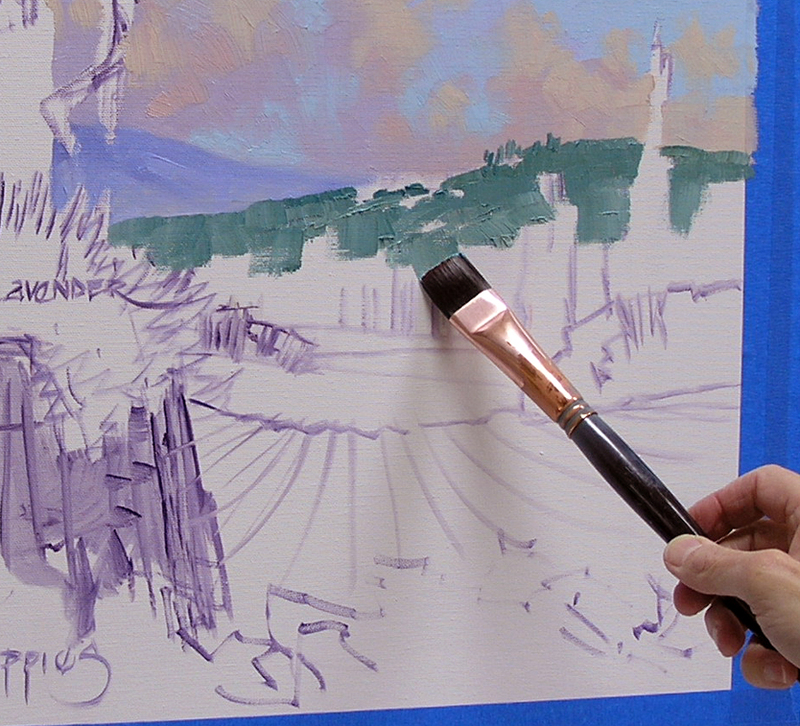 I’ve made a warm green for the foliage still remaining on the vines, using Ultramarine Blue + Cadmium Yellow Medium. The foliage is blocked in above. I’ve thrown in a few brushstrokes of Pthalo Blue + White. This adds interest and depth to the wisteria leaves. The nice thing about painting on a white canvas is the areas not covered give me an idea of how the snow will look on the foliage. 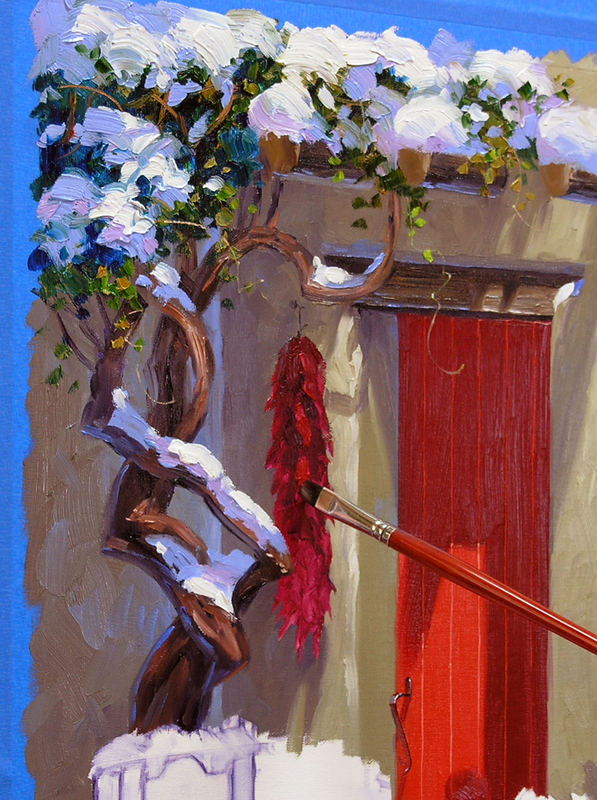 The final touch to the snow covered Wisteria is drawing the tendrils with a fine brush. When painting these I never fail to think of a childhood song. It was one of my favorites, “there was an old lady who swallowed a spider, that wiggled and jiggled and tickled inside her”. The wiggly, jiggly tendrils just tickle my imagination. Now let’s turn our attention to the chili ristra. 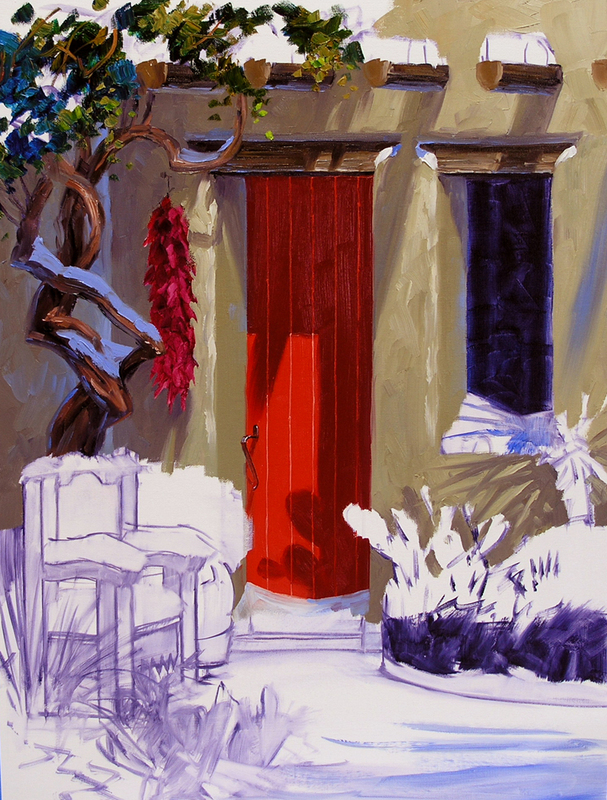 Because the door is bright red I make the chili peppers a darker red, using a mixture of Alizarin Crimson and Cadmium Red Deep. A little White is added to the mix for the highlights on the spicy peppers. The yucca casts long, narrow, spiky shadows across the snow drifted on the window sill. These are fun to paint. After blocking in the basic shapes of the shadows I go back with a clean brush and soften the edges. 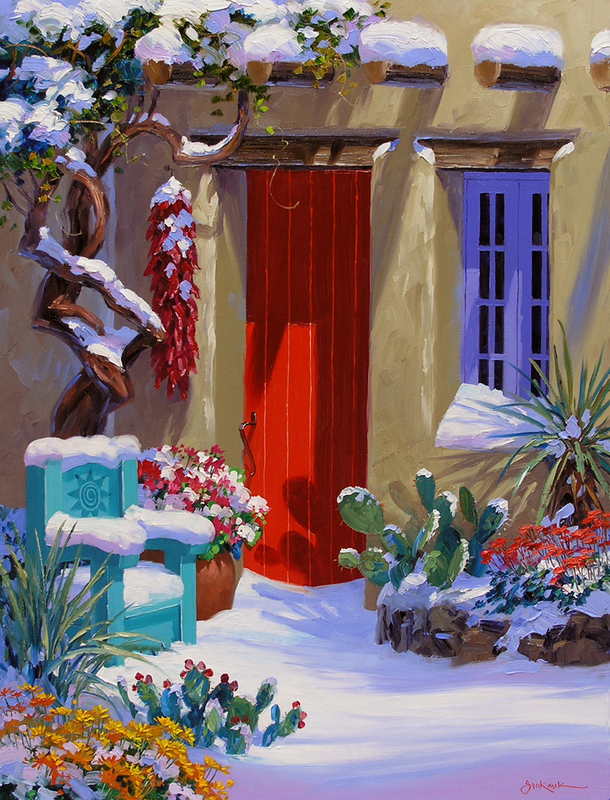 The Geraniums in Snowy Embrace were red and very striking juxtaposed against the blue door. I’ve made these Geraniums pink to look better with the red door. They also will be a nice combination with the turquoise bench. The first step today is to mix all of my adobe colors, from the darkest shadows to the lightest lights. 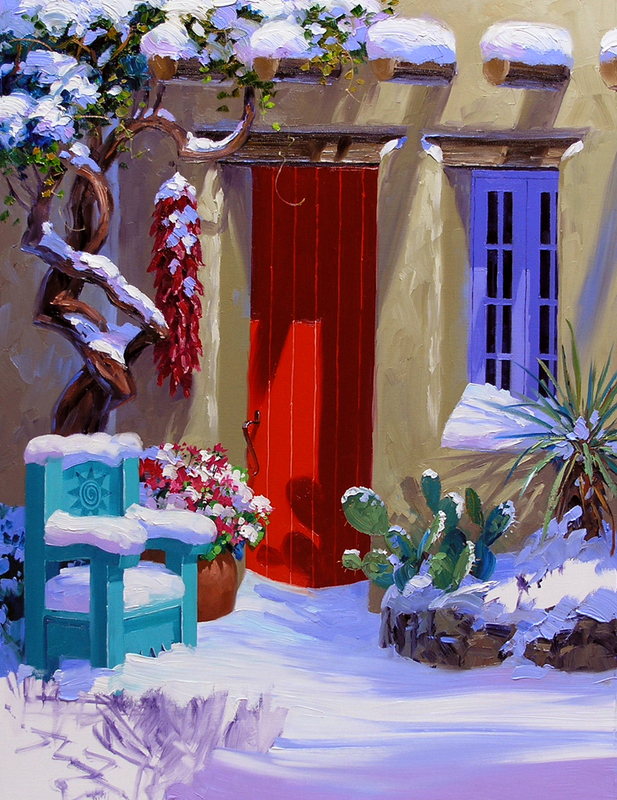 The piece my collector liked, Snowy Embrace had a blue door with a touch of red in the adobe. 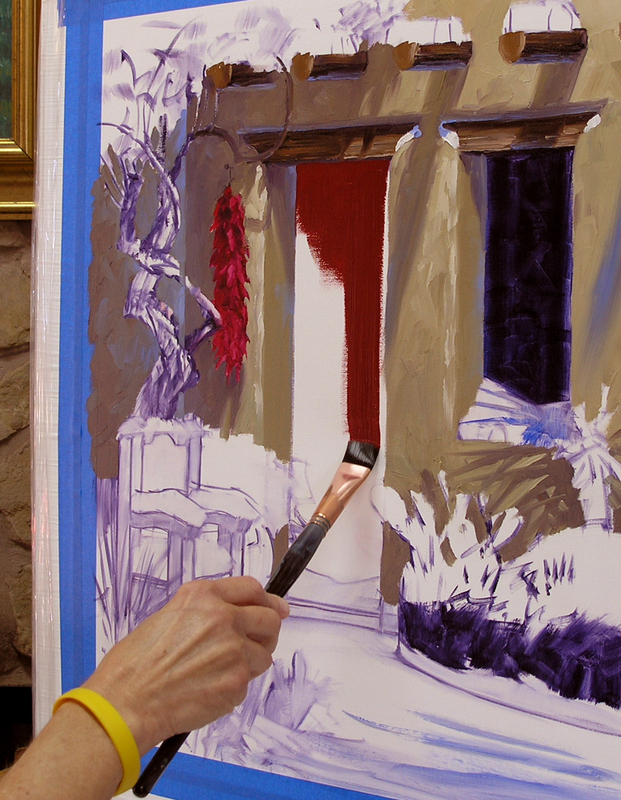 Because this painting will have a red door, that color of adobe wouldn’t look very good. So I use a base combination of Cadmium Orange + Pthalo Blue + White which will give the walls a tiniest little bit of a green cast. This won’t be discernible to the eye but will make the red door appear even more vibrant. The shadows are blocked in to begin with, then the sunlit area of the wall is painted. The upper part of the wall is lighter because it is closer to the light source, the sun. The wall darkens in value as it gets closer to the ground. Using the same sequence I paint the door. Shadows first, then the light. Notice the shadows cast by the vigas. The edges are sharper close to the base of the protruding beam. As the shadow descends, away from its source, the edges soften. Also the color of the shadow gets cooler (bluer). This is fun to observe in nature, take a moment on a sunny day to study the shadows cast around your home. 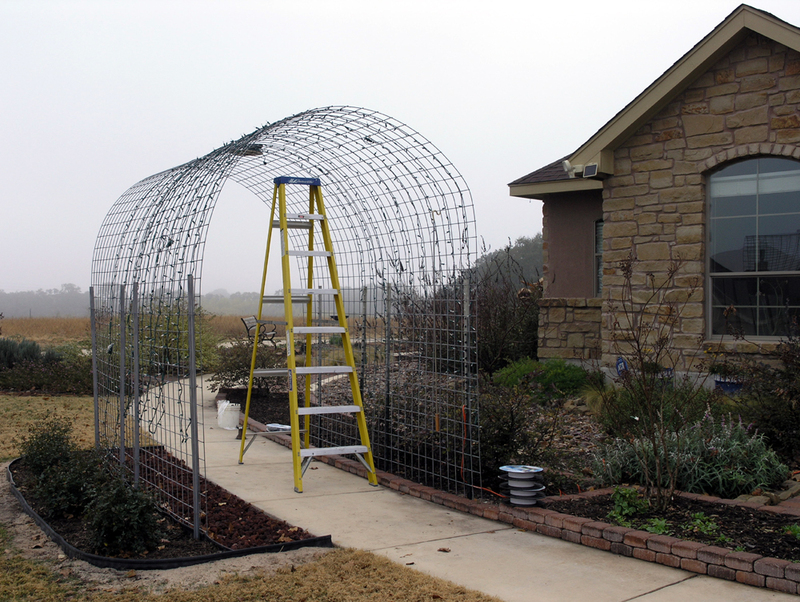 We installed an arbor over our front walkway made of two sections of metal fencing, arched over and anchored to steel posts. The plan is to plant grapes in January. Eventually the arbor will be covered in grape vines, offering fruit and shade in the summer and an interesting texture of trunks in the winter. Martha Gonzales Roses are planted at the base on the street side for colorful blooms and evergreen foliage. 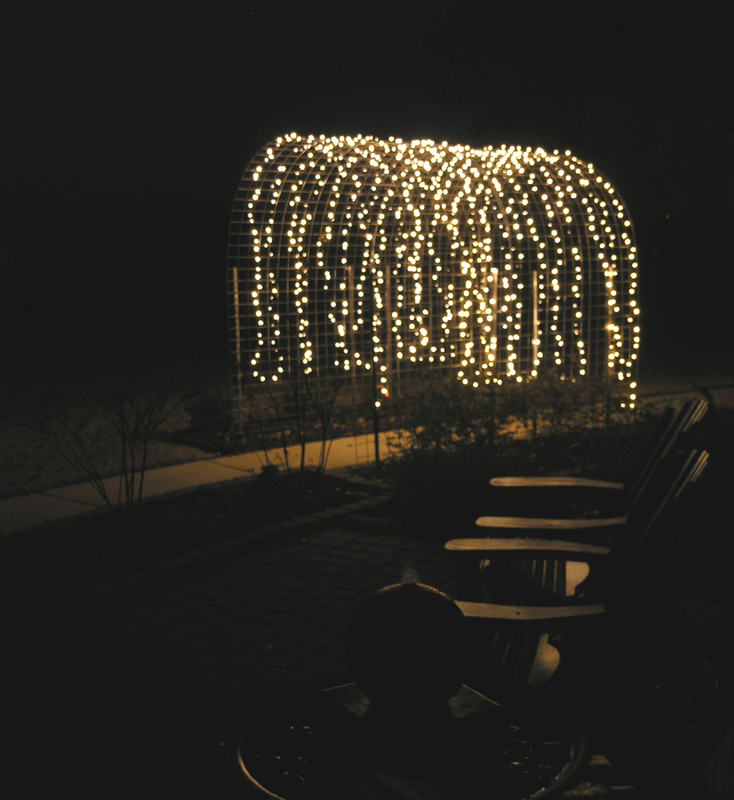 Our neighbor came up with a great idea, since it’s Christmas why not cover the arbor in lights? This morning it’s back to the easel. 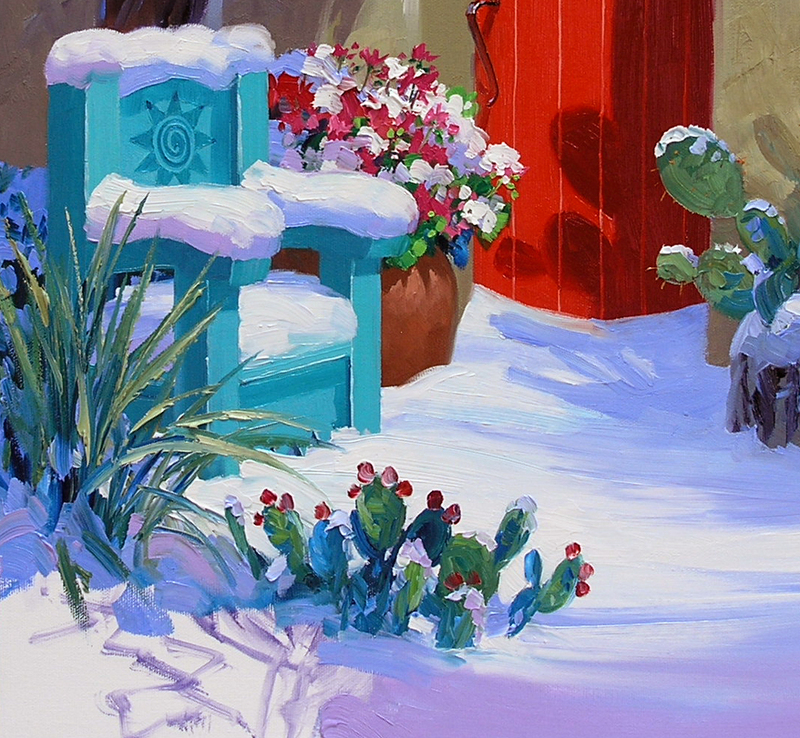 Now that we are decorated for Christmas, “Let it Snow, Let it Snow, Let it Snow!” This commission is for a longtime collector who saw Snowy Embrace at the Santa Fe Art Collector Gallery. Karen and Ed fell in love with the painting but it was already sold. Besides they really wanted a piece to hang with another Senkarik that has a vertical orientation. So we decided to collaborate on a snow painting. This has been a lot of fun. Karen went through all of my blogs, picking elements she especially liked. 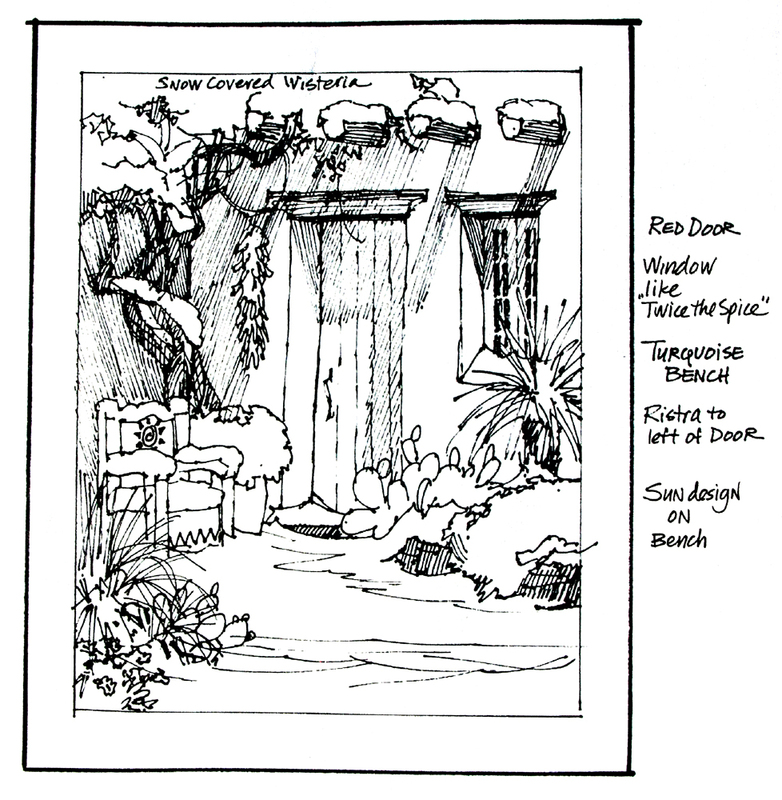 Then I combined them into the sketch shown above. To see an enlargement just click on the picture. How you can get a Mahl Stick like Ours! 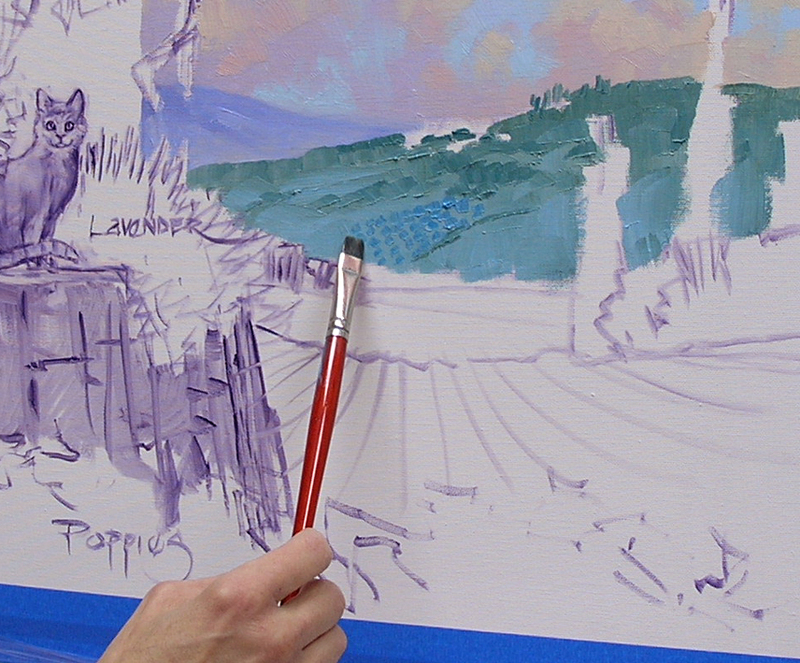 I can hardly believe the response to my blog on using a mahl stick. Several of you wanted to know where we got the ones we use. Jack and I purchased them from the Container Store in San Diego. But that was in 1994. Thank goodness for the internet. After searching the net and a couple of phone calls I have some good news for you. The mahl sticks are still available. It is actually called a High Reach Garment Hook, used for lifting hanging clothes off high closet rods. But it works perfectly for a mahl stick. And it is only $19.99. Just click here to see more info and to purchase the mahl stick.